Congratulations on your new home! Now that you’ve closed, it’s time to pack up and move. 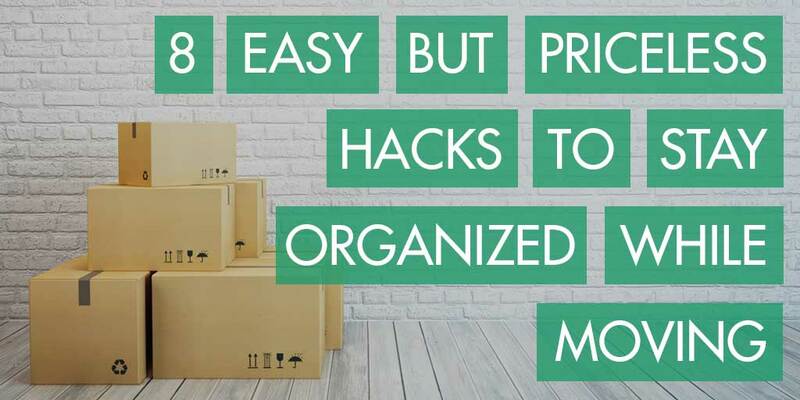 Before you fill your first box, check out these eight easy but priceless hacks to stay organized while moving. Don’t move anything that doesn’t fit or you don’t use. Be merciless in paring down your things. Set up three piles; move, donate, and sell. Take the donation pile to a local charity, and get rid of the “sell” pile either online or at a moving sale. Weeding out your things frees up your room and lets you start fresh and less cluttered in your new home. Make a list of your items and where they will be placed in your new house. Add in items you’re planning to buy. Since your new place will undoubtedly be laid out differently than your current residence, the list will help you figure out where everything will go in advance, so you won’t be trying to make these decisions on moving day. Keep this list on your laptop or tablet, and also print one to have with you. Nothing kills a good packing session like running out of boxes. If they’re scarce, it’s also tempting to cram everything into the ones you do have, creating an unpacking nightmare. Do an online search to find a place close by that sells boxes. If you want to save a bit of money, liquor stores usually have boxes they will give away if you ask nicely. Stock up on tape, bubble wrap and newspaper to wrap your breakables. Be kind to the earth and recycle as much of your packing materials as possible after the move. As you start packing, use colored tape to flag which room the box belongs in. This system points the movers in the right direction so they can unload the truck faster and with fewer questions for you. Plus, if a box is accidentally in the wrong room, you’ll figure it out much quicker with this system. This may sound rigid, but this hack will save you tons of time and frustration when you begin unpacking. As you pack each box, note everything that goes into it. Put a number on the box that corresponds to your list. Once you’re in your new place, you will easily know which boxes contain your most urgent stuff. Setting up your movers in advance is key to a low-stress moving day. Ask your friends or co-workers for references, and call a few to get quotes. Once you compare prices and references, choose one and schedule the day and time you want them to arrive. Be sure to explain what they will be moving and determine the amount of time you will need them. The most important part is to get everything in writing. Don’t spend your first nights in your house without connections! Schedule appointments with the electric company, cable company, and internet provider for your first day in your new home. That way you’ll have a minimum amount of down time after your move. Finally, plan on avoiding the stress of “oh no, where is it?” Get the stuff you can’t live without and pack it in a box or suitcase. Water, snacks, your phone charger, a bath towel for each family member, scissors, tape, a pen, and anything else that would be painful to live without for even a day. Put this box in your vehicle, not with the mover, so you know where it is at all times. Getting packed and ready to move into a new home can be stressful, time-consuming and challenging. Unpacking and getting your new place situated can be daunting, especially if you weren’t organized during the packing process. But, if you plan, pack thoughtfully, and choose movers wisely, you can be in your new home, set up and ready to resume your life in no time.